1. that Elizabeth Cady Stanton was the mother of seven children? Susan B. Anthony would baby-sit Stanton's children while Stanton wrote suffrage speeches and petitions that Anthony would deliver. 2. that one of Elizabeth Cady Staton's daughters, Harriot Stanton Blatch, also became an important leader in the suffrage movement? 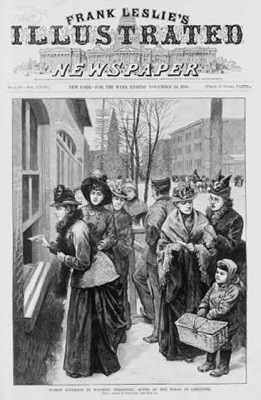 3. that many early suffrage supporters, including Susan B. Anthony, remained single because, in the early 1800s, married women could not own property in their right and could not make legal contracts on their behalf? 4. that in the early 1800s, in most states, women could not have custody of their children? According to state laws, children "belonged" to the husband. Not until the 1840s, when women began to organize to obtain legal rights, and gradually laws began to change, could women own property in their right after marriage, or obtain custody of their children. 5. that there is a difference between the terms "suffragist" and "suffragette?" 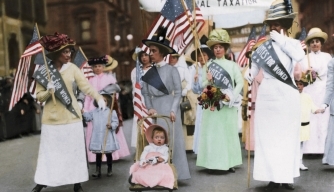 In the United States, supporters of woman suffrage preferred and used the term suffragist. 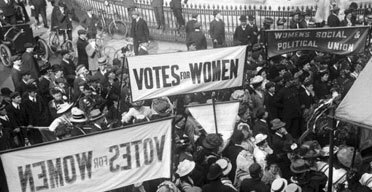 In Britain, militant supporters of woman suffrage called themselves suffragettes. 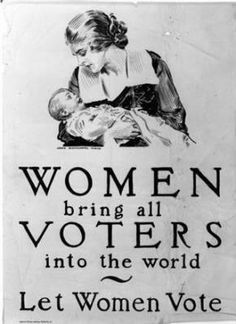 When the American press, or those who opposed woman suffrage, called an American woman a suffragette, it was intended to be derogatory. 6. that actor Katharine Hepburn's mother was a prominent suffrage supporter from Connecticut? 7. that American woman who were jailed for demonstrating for the right to vote were force-fed in prison when they went on hunger strikes? 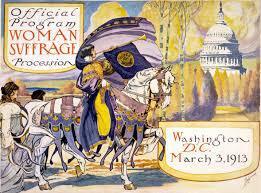 8. that woman were the first protest group in US history to picket the White House? Since then, this tactic has been used by many groups to protest for rights. 9. that Alice Paul, leader of the National Woman's Party, was put in solitary confinement in the mental ward of the prison as a way to "break" her will and to undermine her credibility with the public? 10. that suffragist Inez Milholland was the first woman to have a memorial service for her held in the United States Capitol? 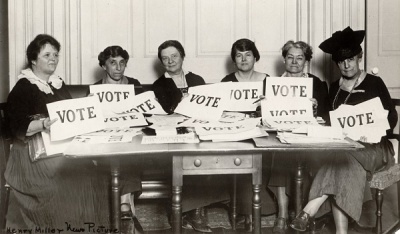 11. that the nineteenth amendment to the Constitution granting women the vote was passed by only one vote? Tennessee was the 36th state to ratify the Amendment, and it passed the legislature when Harry Burn, a young legislator, changed his vote to "yes" after receiving a letter from his mother telling him to "do the right thing."